The Ministry of External Affairs of India has placed an order to lease 55 Mercedes-Benz E 250 CDI cars. These cars will be used by visiting heads of other countries, presidents and top diplomats. The E 250 CDIs will begin to be used at the upcoming India-Africa Forum Summit. The Mercedes-Benz E 250 CDI is powered by a 203PS/500Nm 2143cc diesel engine. The engine is mated to a 7-speed automatic transmission which propels the car from 0-100kmph in 8.5s. The top speed is just shy of 250kmph. Mercedes claims to have sold 30,000 E-Class models so far in India. The car is touted as the Stuttgart carmaker's best selling luxury model in its segment in India. Roland Folger, managing director and CEO, Mercedes-Benz India commented, "Mercedes-Benz has always been the preferred luxury brand for heads of states across the globe including India, and we are extremely proud of this fact. The impeccable sense of prestige, luxury, safety and comfort offered by a Mercedes-Benz is rarely matched and makes us the obvious choice for such exclusive clientele. The mandate from the Ministry of External Affairs opting for the E-Class luxury sedan is a reiteration of the inherent strength of our product and of the unsurpassed brand equity that Mercedes-Benz commands in the Indian luxury car market." India's largest luxury car maker Mercedes-Benz became the preferred luxury car brand of choice for the Ministry of External Affairs, Government of India. 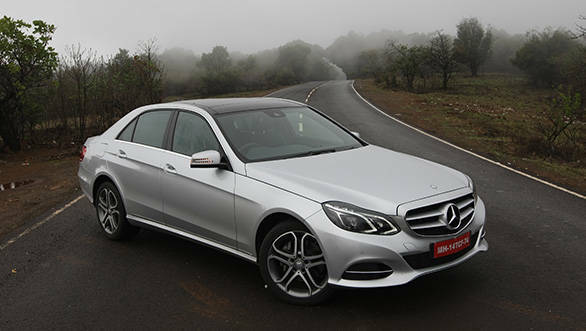 Mercedes-Benz India has won the mandate to provide 55 top of the range E 250 CDI luxury sedans on lease to the Ministry. These high-end luxury sedans will be used by the visiting foreign dignitaries of the Ministry comprising Head of States, Presidents, Prime Ministers and top Diplomats. The ministry has inducted on lease the top-end E 250 CDI to be used for visiting foreign dignitaries comprising Head of States, Presidents and top diplomats, starting with the upcoming India Africa Forum Summit (IAFS). With more than 30,000 units sold in India, the segment leading E-Class is the first luxury car to be produced in India since 1995, and remains by far the largest selling luxury car model in the country today.